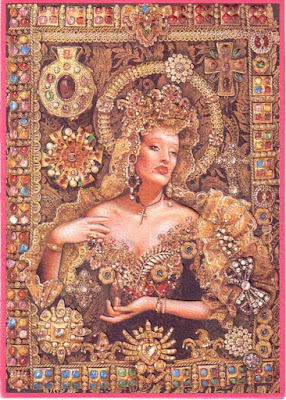 In 1987 after Bernard Arnault, of global luxury giant LVMH Moët Hennessy Louis Vuitton, which is the owner of Louis Vuitton, Christian Dior and Givenchy, asked Christian Lacroix to create a bespoke couture house for his luxury goods giant. At that time Lacroix had just received a Council of Fashion Designers of America award for his creations at Jean Patou and the majority of experts foretold him the brightest future of the next big star after Yves Saint Laurent. Lacroix draws most of his inspirations from his roots - the south of France, mediterranean. In early childhood, Lacroix attended bullfighting events and enjoyed Gypsy and Provencal traditions as well. Some time afterwards his family moved to Arles, a city in the south of France, in the Bouches-du-Rhône department. It was the city of southern culture, with breathtaking views and expansive tempers. There was a yearly carnival during Easter, when people and women especially put on their brightest, best clothes, which combined old vintage dresses with laces, modern high heels and hats. Maybe that's was the source and inspiration of the Lacroix's fashion vision. 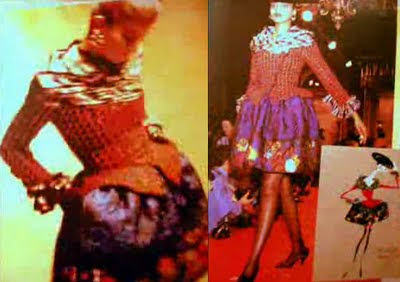 In Lacroix's very first fashion show in 1987, he designed a puffball skirt "Le Pouf", was an instant fashion classic. A taffeta or satin balloon of fabric that fell like a parachute from the waist and gathered at the hem, it reinvented the ballgown for the late 20th century. "I always love to do scrapbooks and collages," he explains. "I was alone in a hotel in Florence, cutting up some old fashion engravings from the 1880s with bustles, and I was playing around and I had the idea to cut the skirt like a mini-skirt and to put some modern legs underneath." Would he be happy to be remembered for inventing the pouf? "Why not?" he laughs. "When I’m on the phone I’ll sketch silhouettes, and very often it’s still a pouf that I draw. While it is for sure that Lacroix has been affected by reduced spending amid the economic crisis,the roots fo its troubles lay much deeper. According to Patricia Pao, executive of Pao Principle, a retail New York-based consultant group, "Lacroix, while beautiful, has long struggled to find an audience." she said. The major problem of Lacroix has always been that he could never really come to realization how to make his gourgeous pieces work for the modern working woman. The problem was, and still remains, that the designer kept creating clothes in a style of a Spanish matador, for example, with gypsy fringing, splashes of 18th century corsets and neon psychedelia (more often all in the same piece), which were never practical for wardrobes of working women. And what is even more, the items were not cheap, either. The major luxury groups such as Louis Vuitton, Chanel, Gucci, and Hermès are now mostly prospering due to the diversity of their holdings. In spite of the recession and crisis, perfume sales, for example, are holding up relatively well. According to MHLV, sales in its fashion and leather accessoires sector went up by 11 per cent to 2.1 billion dollars in the first quarter of 2009. 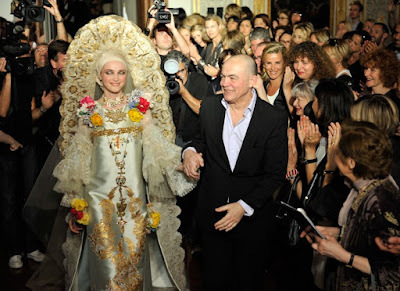 Haute couture, the basis of Christian Lacroix's operation, will never be able to make the kind of profit that perfume, accessories and ready-to-wear fashion make, and this turns out to be a major reason for the label's demise. While prices for dresses haute coutute often climb up to $10,000 to $250,00, in reality there are very few pieces that are actually being sold. 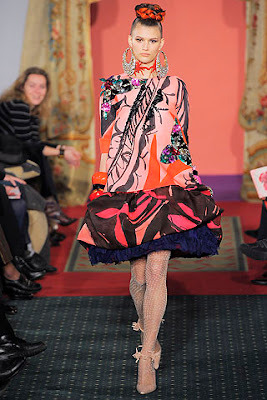 Unlike Chanel, christian Dior and Armani, which have a long ago created their bestselling perfumes and accessories, but even tho how much I love Christian Lacroix I hate to say he has still continued to rely on its gorgeous, but very expensive dresses. In summer 2009, Lacroix's company owner, Florida-based Falic Group, has been involved in serious discussions with a group of investors from Switzerland since late last year. In a letter to his 125 staff, Lacroix wrote that he will give "200 percent" to keep the 22-year-old couture house in one piece, to "preserve the know-how, without which the lungs and the heart of the house couldn't exist." 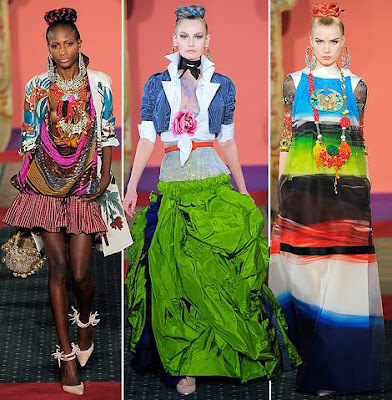 Lacroix is renowned for lavish and colourful couture shows, and is one of the main drawcards at Paris couture week each season. The reality is that couture customers are few.... Don't you wish the world is still like those movies back in the 50s and 60s everyone went through the whole 9 yards to dressed up and looking fabulous, well, as much as we like them to be, it's still a fantasy and I really hate to see my hero, mentor, who inspired me to be a fashion designer. and here is the story why I was deeply sadden to see Huose of Lacroix filing bankrupt. Since I was little, I've always love to draw, sketch beautiful dresses. 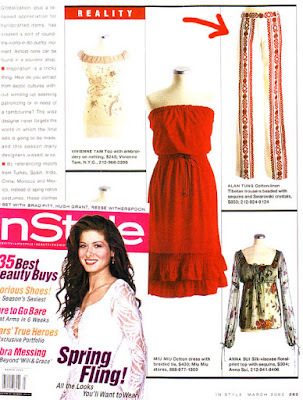 I've always LOVE bright colors, beadings & embroideries embellishments. When I was in sophomore in high school, I started to think which college I want to attend and told my father I wanted to be a fashion designer. 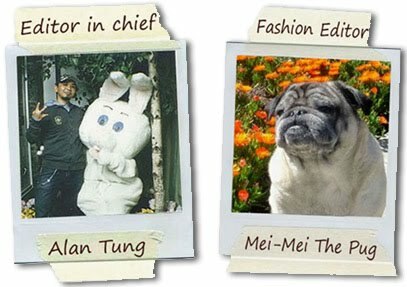 Of course as being the oldest son in the family and from a traditional Chinese family, my father was not happy about it, infact we've been fighting ever since daily after I've told him I wanted to choose fashion design as my career. So one day I mustered up some courage and called the French embassy to get a list of address of the fashion houses in Paris then I mailed them my amateur design sketches to ask them what they think of my designs and if I have what it takes to be a fashion designer and which university to go. 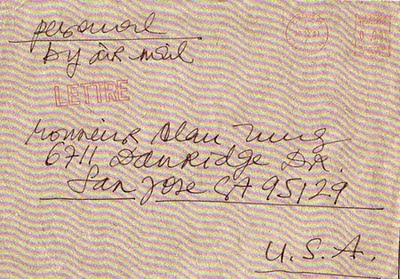 2 months went by, I've received no reply of course but one day I received an handmade envelope that's from France, I was so excited and opened the letter, there it was, an hand written 2 pages letter from Monsieur Lacroix. He told me that I should attended Parson School of Design in NYC and encourage me to study fashion as my major and career. I showed the letter to my dad, because of this letter, it has changed my father's view on the path I wanted to choose and it changed my life then I went to Parsons School of Design in NYC in year of 1992. 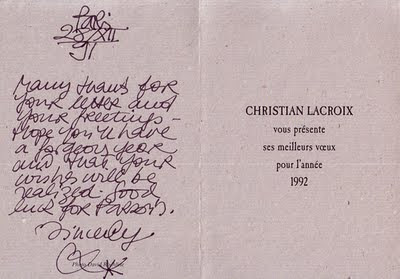 Every season I will mail monsieur lacroix some sketches so he can give me some critiques, and lasted from 1990 ~ 1995. 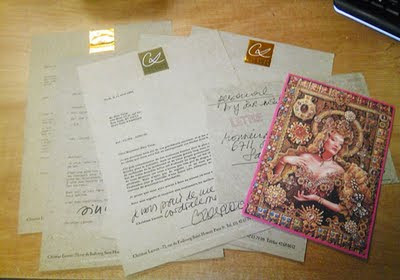 Here is a photo of the letters I've received from Monsieur lacroix. Now I've graduated from Parsons for 12 years, even tho I've never made it big in the fashion industry, but I still thankful that I am able to do what I love for living - designing ! and all of this wouldn't happen if it wasn't because of the very 1st letter I've received from monsieur Lacroix & his encouragements. So now seeing his company went bankrupt, It saddens me personally & all I can say is we've lost a great talent in the fashion industry! One from the hit show "Absolutely Fabulous" that feature Lacroix haha. As we all know "Eddy" idolize Lacroix like "GOD" so of course in the very last episode of "Ab Fab The Last Shout" when her daughter "Saffy" is getting marry & in need a wedding gown, who did she called? 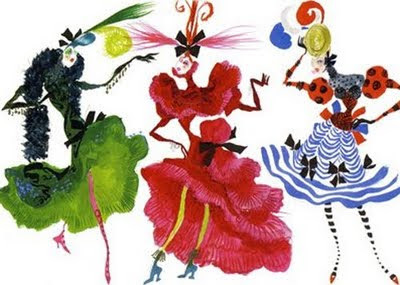 of course Christian Lacroix ! 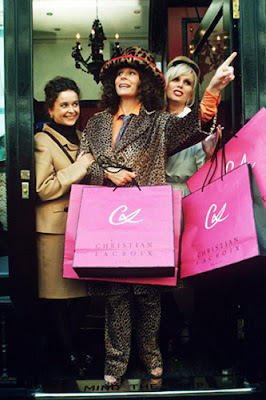 Here is a nother music video of Pet Shop Boys featuring Ab Fab in Lacroix outfits haha love that show!